Rear: Luxury ride coil springs. 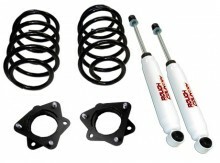 Shocks: Kit includes (2) rear Nitro 9000 series shocks w/jounce bumpers. and parts ordered must be in stock. • Easy Install - No strut compressor is required. • Rear shocks manufactured with recoil cut-off construction. • Unlike the polyurethane kits, this kit DOES NOT require disassembly of the strut. Click the button below to add the 07-09 4wd FJ Cruiser 3" Series II Suspension to your wish list.